Stacked bar: A collection of data presented in horizontal rows (shown on the Y Axis and the Legend), demonstrating how each selected component is compared to its whole. 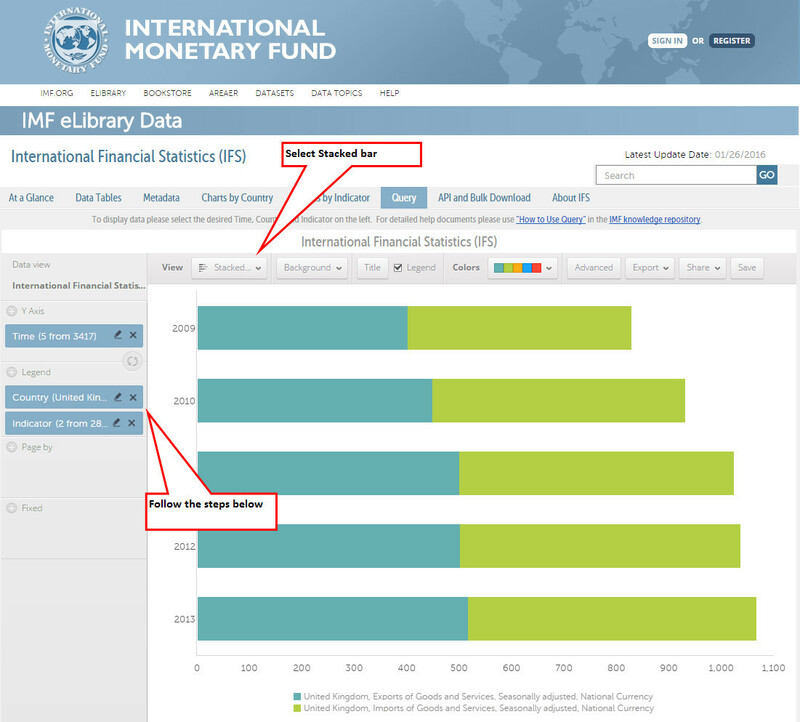 Stacked bar Instructions - The sample chart uses the International Financial Statistics dataset and displays data for the United Kingdom's trade volume from 2009 through 2013. Users may follow the steps below to replicate the following chart. From the pop up dialogue box select 2009 to 2013. Click Apply and OK.
From the pop up dialogue box, search for United Kingdom, and then select the country by checking the box right besides its name. Click Apply and OK. Select the following indicators: "Exports of Goods and Services, Seasonally adjusted, National Currency" and "Imports of Goods and Services, Seasonally adjusted, National Currency". Click Apply and OK.